In 2015 Belarus joined the European Higher Education Area (EHEA) and committed to putting a Roadmap for higher education reform into effect by 2018. The implementation of the Roadmap is running behind schedule, which poses a threat to the fulfilment of Belarus’ obligations by the due date. A new analytical paper released by the Ostrogorski Centre today analyses the main challenges to implementation of the Roadmap in Belarus; it also provides recommendation which could help to do it on time and benefit a wider range of stakeholders. At a conference of 47 EHEA Ministers of Education (May 14-15, 2015, Yerevan) Belarus took on commitments to implement a Roadmap for higher education reform. It is expected that the harmonisation of Belarusian and European educational standards will ensure higher quality education, more opportunities for studying and employment, deeper integration in the European and global educational area, and the inclusion of different social groups, including disadvantaged communities, in education. The programme of higher education reform in Belarus stipulates a mechanism of international support and consultation for the implementation of the Roadmap by 2018, when the final report on the implementation of the Roadmap will be submitted at the Ministerial Conference in Paris. An Advisory Group on Support for the Belarus Roadmap was established to assist in the implementation of the Roadmap. It includes representatives of governments, supranational institutions, and civil associations of member countries of the EHEA along with three representatives of Belarusian state education sector. 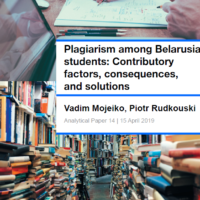 Belarus would like to avoid a painful breakdown of its educational system, bypassing ‘empty-headed copying of western models’, as Aliaksandr Lukashenka likes to put it. He has named several possible negative effects of internationalisation for Belarus, including brain drain and loss of ‘patriotic, moral, and aesthetic education’. The fact that the country’s leadership takes this stance is a significant factor hindering the integration of Belarus into the EHEA. What’s more, relevant legislative changes proposed by the Ministry of Education are contested by other governmental bodies and ministries, which are often wary of change. A group of experts from the Public Bologna Committee has developed a methodology for monitoring the quality of Roadmap implementation. This allows monitors to use an index to measure the Roadmap’s progress. The term set for Roadmap implementation is three years. The final index value as of June 30, 2016, was 8,7%. This leads experts to conclude that Roadmap implementation is still in its initial stages, and in some areas has not even started. It should be noted that the Advisory Group on Support for the Belarus Roadmap is more optimistic about the Roadmap’s progress, but its working documents are not available publicly, making assessment difficult. Experts assert that the development and implementation of the National Qualification framework, the quality assurance system, ECTS credits system, and Diploma Supplement have been delayed for unknown reasons. For three years, the Ministry of Labour has been working on the National Qualification framework, piloting projects for professional standards. The obligation for students whose education is financed by public funds to accept work placements upon graduation has remained in Belarus since Soviet times, which does not correspond to EHEA and demand in the economy. Moreover, there is a discrepancy between the education sector and the needs of the labour market. Most Belarusian HEIs are state-run; they are subject to orders from higher executive powers. Rectors are appointed by the President and are under political governance. Universities are still used as a tool for political education by means of state ideology courses, youth organisations such as the Belarusian Republican Youth Union, obligatory work, and participation in state holidays and political events. For the most part, civil society is only able to influence decisions by the authorities through external actors, primarily the European Union. Social dimension and labour market. The obligation to accept work placements should be limited to specific areas, where there is a significant need for professionals. Legislative measures should be taken to provide incentives to employ university graduates via preferential tax treatment for employers and other fiscal mechanisms. Tools to ensure this include ratings and monitoring of the quality of education. Moreover, HEI funding should depend on the level of employment among graduates. Student and staff mobility. Bureaucratic barriers to mobility should be eliminated in cooperation with the stakeholders among governmental bodies. State funding of academic mobility should be significantly increased. To prevent brain drain, students should be offered prospects for professional development through social partnership with employers. Academic freedoms and principles of university autonomy. Guarantees of citizens’ and institutions’ rights to free teaching, learning, research, and protection from government interference should be codified in legislation. Institutional autonomy should be guaranteed in organisational, financial, personnel, and academic spheres. Administrative barriers to creating freely functioning student unions, trade unions, and other public associations should be eliminated. Transparency and involvement of a wide range of stakeholders. The institutions responsible for the implementation of the Bologna principles should provide stakeholders and the public with up-to-date information on the progress of reform. The Advisory Group on Support for the Belarus Roadmap should engage a wider spectrum of stakeholders in its activity, including NGOs and business and student associations, as well as facilitate regular expert dialogue.